Stems: Erect, stout, more or less densely hairy. Leaves: Two types; usually whorls of 3; blades deeply 3-5-lobed; lobes rhombic-ovate, usually curved toward base, margins toothed or incised to below middle, undersurfaces flattened-hairy; basal leaves 2.4 to 8 inches wide, on stalks 5 to 14 inches long; involucral leaves 2-3, 2 to 5.6 inches, on stalks 1 to 3 inches long. Inflorescences: Solitary flowers or in cymes; stalk of central flower often bearing secondary involucres. Flowers: 1/2 to 1 inch across; sepals 5, petal-like, 1/4 to 1/2 inch long, whitish or greenish; leathery; petals absent; stamens numerous; pistils numerous, in central cylindrical, thimble-shaped cluster. Fruits: Achenes, white-woolly, 1/12 to 1/8 inch long, borne in elliptic head .6 to 1.2 inch long, .4 to .75 inch thick. Habitat: Woods, prairies, riverbanks; dry rocky to moist soils. Uses: Native Americans steeped the roots and took the liquid to treat whooping cough, tuberculosis, and diarrhea; applied a poultice of root to boils; and used the smoke from burning seeds to revive someone who was unconscious. Iroquois men were said to have placed the roots under their pillows to foster dreams about the faithfulness of their wives. 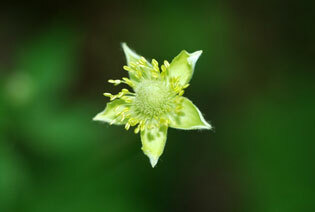 Comments: The common name thimbleweed alludes to the appearance of the fruiting head.